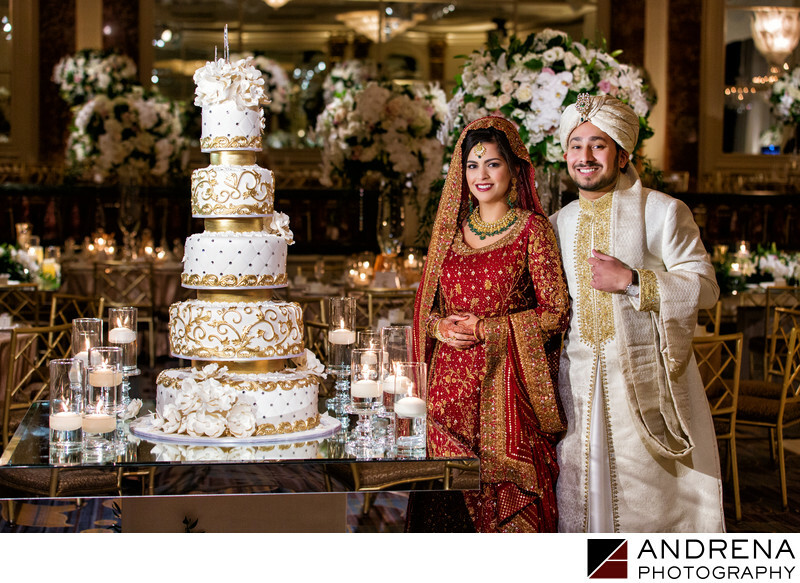 The Beverly Wilshire is a stunning place for a wedding, and as a Los Angeles and Beverly Hills based photographer, I have been extremely fortunate to have worked there many times. For this large wedding reception, Fayaz and the team at Bloom Box Florist created a dazzling explosion of cream and white flowers. The mirrored cake table lent a sparkle to the gorgeous creation Royal Cakes, and the gold accents on this towering confection added elegance to an already beautiful ballroom. One of the great things about working at the Beverly Wilshire is that the staff is very helpful to photographers who want to create beautiful images of their ballroom. As the ballroom includes two levels, this also provides photographers with better vantage points from which to document certain events, such as the first dance.